In this lesson, we will learn about adjacent angles. When two angles are adjacent and these angles add to 180°, these angles become supplementary angles. 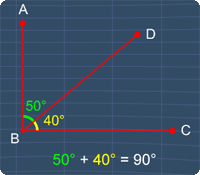 Now, if two angles are adjacent and these angles add to 90°, these angles become complementary angles. Adjacent Angles from MathExpression.com on Vimeo. In this lesson, we will learn about adj. angles. Let's take a look at these two angles. 45 degrees and 110 degrees respectively. Now, these two angles are adjacent angles. 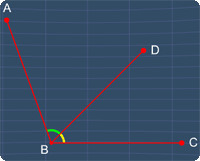 This is because, these 2 angles shares a common side, BD, a common vertex B and these 2 angles do not overlap. Next, when I move this arm BD, take note of the adj. angles. Let's find out. We can see that, these 2 angles have a common side AC and a common vertex A. Furthermore, these 2 angles do not overlap. Therefore, these are adj. angles. Next example, how about these 2 angles? 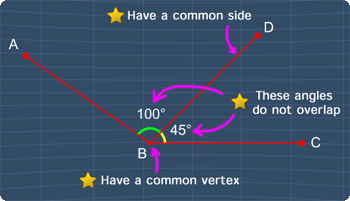 Here, we can see that, these angles have a common vertex A and common side AB. However, these angles overlap. Hence, these are not adj angles. Next, are these adj. angles? Here, these 2 angles share the same vertex A. However, these angles do not have a common side. Hence, these are not adj. angles. Final example, these 2 angles have a common side BC but, do not have a common vertex. You can start by going through the series of questions on adjacent angles or pick your choice of question below.